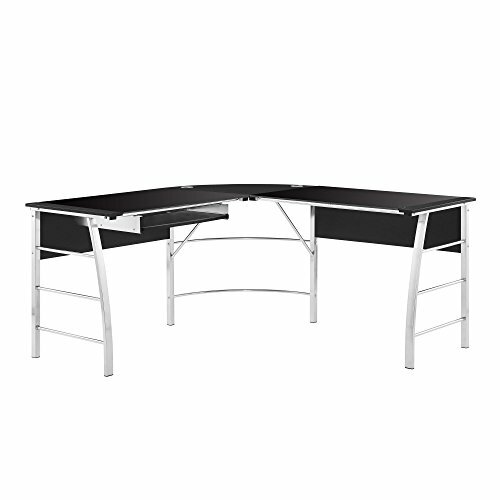 The Altra Wingate Glass Top L Desk features a modern design with a sleek, glass work surface and metal chrome legs. With 2 large glass sides and a laminated MDF corner, the glass-top desk will give the room a refreshing contemporary look. Additionally, the desk’s L-shape provides more workspace than the traditional desk, so you’ll have plenty of room for a computer and all your office essentials and not to mention it can be placed in a corner or in the middle of the room. Make your office function for you. The desk also comes with a wire-management grommet in the corner to prevent cords from cluttering the workspace. This beautiful black glass will certainly give your office a noticeably upscale look. Altra Wingate Glass Top L Desk requires assembly upon delivery.